NOTE: All information given is given as guidance only. If the steps are followed correctly, no harm should come to your hardware, software, or any of your files. However, I will not be held responsible for any problems that occur due to following this guide; following instructions given are done so at the users discretion. I got a BSOD but didn't have time to see what it was. What do I do? What should I do if the fix doesn't work? There are many causes to stop errors, however this isn't such a bad thing, because as I mentioned, stop errors are designed to help in finding the problem. Both hardware and software can cause the problems, but the most common errors are caused by faulty components, driver problems, or unstable overclocks. To find out what stop error you had, go the control panel, then administrative tools. 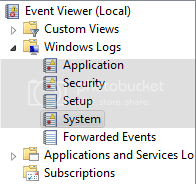 Open up event viewer. 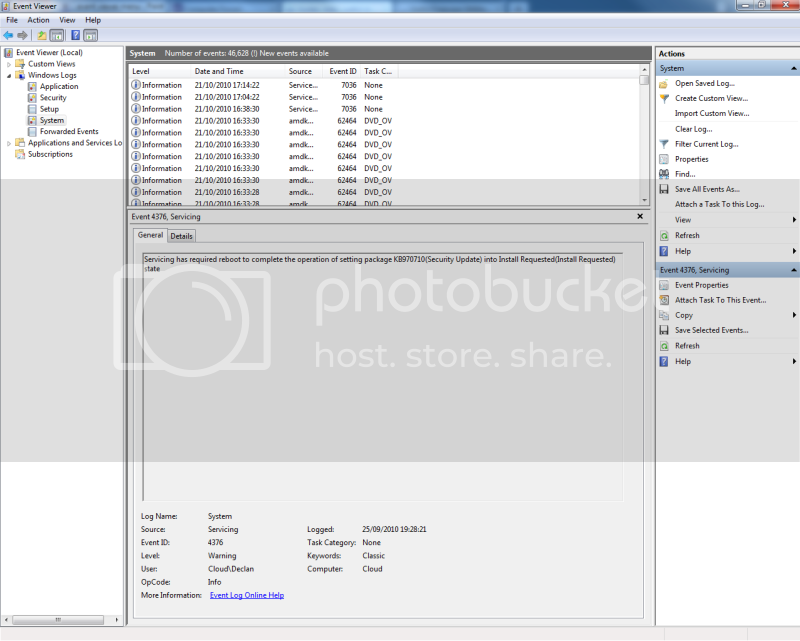 You will see on the left of the window a set of 4 folders, like in the picture below. Click Window Logs, then System. The computer has rebooted from a bugcheck. The bugcheck was: 0x0000007e (0xffffffffc0000005, 0xfffff88004badcf7, 0xfffff880021566a8, 0xfffff88002155f00). A dump was saved in: C:\Windows\MEMORY.DMP. Report Id: 101110-24367-01. The first hex value outside of the brackets, in this case 0x000007e, is the code that would appear on the BSOD, and the code which you will check against the entries in the list of codes below. It should also be pointed out that nearly all errors can be caused by faulty memory. Should you be having a recurring problem, and are receiving BSOD's regularly, I recommend first run memtest before reading on for your specific error, as some of the solutions, amy not be should it be faulty memory, and that could mean assuming a Windows installation, or piece of hardware, is faulty, when in fact neither have the problem, it is your memory throwing up the errors. The windows one can simply be run directly from the .exe file that you download, and left to run. The bootable one must be burned to a disc as an image file. If you don't have a CD/DVD burner, then you can instead run this file to make a floppy disc or USB drive (should your motherboard support booting from USB devices) bootable. Once you have your bootable version of memtest ready, restart your computer and boot from the device with memtest on, and allow it to run. Cause: Contrary to the message, this error doesn't have anything to do with IRQ. The error is caused by the Windows kernel, or more commonly, a driver, attempts to access memory that it does not have permission to access. You should be considering the drivers which you have installed, or not installed as the case may be. If you have recently performed an update to your driver(s) and weren't experiencing the problem before doing so, that will more than likely be the cause of your problem. Are all of your drivers certified to work with windows also? If they aren't, you will usually receive a message upon installation from windows warning you that the driver didn't have certification. 2. Run the windows repair tool. This is on your windows installation disc, or, if you have a prebuilt computer, there is usually either a disc that came with the computer with this on, or a button to press at boot up to enter their own repair tool. Refer to your computer manual for how to do this. If you were overclocking and no errors came up, chances are your overclock was unstable, so fix them, either by dropping them down, or changing the appropriate settings. Cause: The problem is caused when a piece of software has a race condition present in the code. Usually the software that is the culprit is driver(s), the majority of the time early release or beta versions of drivers. The "flaw" in the code can also be artificially caused by overclocking. Fix: If you are overclocking, either remove the overclock, or take the correct action to make the overclock stable. If you are not overclocking, remove all beta drivers, and install the latest stable release. Also reinstall all recently installed drivers, making sure, in both cases of reinstalling from beta and normal drivers, that you fully remove all old drivers first. Cause: The problem is exactly what the message says here, Windows is unable to boot from the selected device. This message generally only occurs of you have and are using a RAID controller or SCSI card, and haven't installed the drivers at all, or properly. Fix: Install the controller drivers, which will be found either on software supplied with your device, or online through the manufacturer's website. If you are unable to boot into a Windows environment, put the hard drive in a system without a controller, or remove the controller from the current system, boot, then install your drivers. Put the controller back in, and see if you are receiving the problems again. and burn to a disc as an image file. Restart your computer, and boot it up from that CD. Memtest will begin running. Allow it to run for at least 8 hours or overnight. If any errors occur in that time, you most probably have bad memory. Cause: This is another problem that is caused by a driver fault. It occurs when a driver uses memory, but does not then free the memory up properly after its operation. Fix: Reinstall drivers. It is not as easy as the other 2 where the types of drivers that cause the problem can be narrowed down quite so easily, so you will have to get the drivers for each component 1 at a time, and reinstall them until you no longer experience any problems. Make sure you fully uninstall the old drivers first. Cause: The error occurs if a registry hive could not be loaded. This would indicate the registry data on your hard drive is corrupted, or got corrupted when loaded into memory. The root cause is usually hardware related, more often than not due to memory. If you are running Vista/7: Restore to a previous point, if you are able to. 2. This may cause problems, but it is possible that it will work. You will need another computer with the same version of Windows that you have, or another installation of the same version of windows that you have. You will need to back up the working registry from that machine, and copy it over to your own. Cause: A kernel-mode process attempted to execute an unknown processor instruction. This is caused by a driver or hardware problem. If that comes up with nothing, you will need another computer with compatible components which you know works, and 1 at a time swap components into the other system until errors occur. Cause: There are 2 possible causes for the problem, both of which are related to the hard drive. The first, some IDE hard drives will write data to the cache out of order to increase the speed at which they work. This can cause integral parts of a program or the operating system itself to become damaged if the system loses power, or there is an unexpected shutdown. If you have the problem with the IDE drive, you must first run the windows repair tool. To run this, put your Windows installation disc into the disc drive and boot from it. There will be an option to repair/fix a windows installation. Do so, then try rebooting into windows. If it fails to fix it, and you can not boot into Windows at all, you will have to format your hard drive and reinstall Windows, as it is too badly damaged. Go into the BIOS, and change the SATA controller configuration back to whichever it was by default. Boot using your windows installation disc, and run the repair tool and let it fix any errors that may have been created, then try to boot into Windows. If that does not work, run the hard drive utility for your hard drive. Each manufacturer has their own, which should be used for their drives only, and no other utility for a different manufacturer's drive should be used. Go to their website to find it. Remember that each is bootable, so you will either need to burn the file to a disc in a bootable file format, to a floppy disc, or to a USB device, should your motherboard BIOS support booting from a USB device. If it fails, your hard drive is dead, and you will have to get a new one. First contact your manufacturer if the drive is still under warranty, as they will replace it for you free of charge should it be faulty, and is still under warranty. If it is the first time you have seen such an error, and haven't received one since, it is possible it is a 1 off occurrence, so don't worry about it unless it happens again. If you see the problem regularly and none of the fixes worked, either create a post explaining your problem and that you have followed this guide, or contact your computer manufacturer. Otherwise seems a good guide. Didn't test any of them though.